In my previous blog, I first posed the question of how in the past the citizens of Leiden availed themselves of water for domestic use, and historical town maps were scrutinised. Just the odd public well or pump is shown on those maps, and quite obviously too few to supply the entire urban community with water for drinking and cleaning. Were those wells truly absent, or were they simply ignored by the map makers? In this blog we shall see whether archaeological excavations in Leiden may provide evidence of neighbourhood wells for water supply. 4. the Kamerling Onnes Laboratory (2001) on the Steenschuur canal, in front of the current Faculty of Law. These four archaeological investigations were selected because they covered relatively large areas and were elaborately published, while also the original documentation was accessible. Fig. 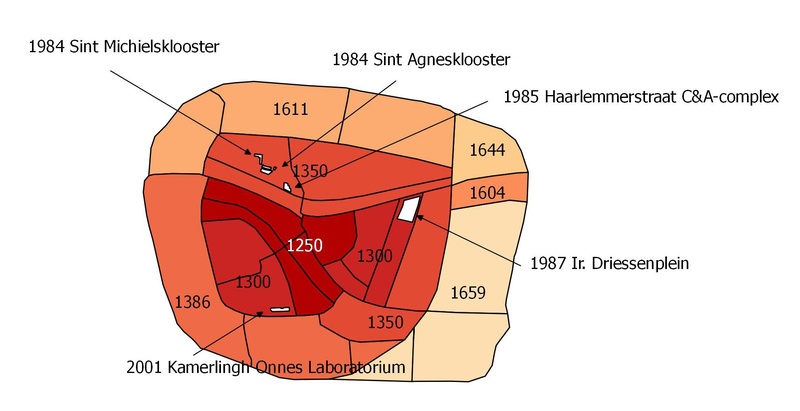 1: Dated urban expansion phases of Leiden and the locations of the four selected excavations. With the data of these four excavations we set to work: the scanned excavation plans were projected ('georeferenced') onto the correct locations in a GIS program. All the outlines of features identified as sanitary infrastructure were traced, and the associated data, dimensions, and datings from the field documentation were joined up with the report. In an archaeological context, sanitary infrastructure besides cesspits and wells also comprises privy vaults, drains, (rain)water cisterns, and barrel-lined wells. In our analysis, their function as interpreted by the excavators was generally adhered to. After eliminating doubtful cases, such as barrel-lined pits which might have served different purposes, we were left with 150 water-supply and waste-water features. For answering our question of whether there is any difference between the medieval (in this context, pre-1575) and post-medieval (post-1575) systems, it is necessary to know the approximate installation dates of the features. One third of the wells and one fifth of the cesspits must therefore be eliminated from the dataset. What remained was a data set of over one hundred dated features. As is evident from figure 1, the selected sites are located in the medieval town centre. It is certain that these spots were occupied from at least the 15th century onwards. Yet we only find four wells in these excavations, as against forty post-medieval water-supply features. Of course, absolute numbers are a somewhat unreliable thing in archaeology. After all, the prevalence of wells in part depends on the intensity and duration of habitation at the site. So it may be more informative to compare the numbers of wells with, for instance, the number of local cesspits. Yet the trend persists: compared to cesspits, medieval wells are barely in evidence, whereas in Early Modern times wells compared to cesspits are abundant. The low number of medieval well suggests that in those days the canals were the primary domestic water supply. While it is clear that the relative rise in the number of water-supply points is in part due to its ratio to cesspits, something odd was going on with the cesspits of Leiden. Cesspits were commonplace in the Middle Ages, but their use - and this is typical of Leiden - was rapidly falling by around 1600. Cesspits were progressively being replaced by sewers and open drains. These carried the 'filthy sewage matter' from the privies into the water of the canals. It's not hard to imagine what this entailed for the quality of the canal water. If in medieval times the canal water was the primary domestic water supply for the people of Leiden, its increasing pollution would have resulted in an urgent search for alternative sources, such as private wells. The alternative that is yet to be considered - and a start will be presented below - is whether Leiden might have developed a system of communal wells. Fig. 2: Graphic representation of the ratio of water-supply to waste-water facilities dating from the Late Middle Ages (in this context, pre-1575) and the Early Modern era (1575-1900) in the data set from four excavations. Recent excavations in Zutphen uncovered the well supplying the ward pump in the Groenmarkt place. It had had a superstructure with a pump from 1625. As is evident from the excavation report and documentary, the well was situated in the street, and the two-metre diameter of its well shaft can be called substantial. Keeping in mind these two features - its location in public space and its large capacity - can we find anything resembling such a communal facility among our Leiden data set? At first glance there seems to be little chance: after all, our selected excavations were for centuries the sites of houses, private yards or back areas in building blocks; no streets or market squares are represented in our data set. Yet against all expectation one neighbourhood or ward pump can be identified. The Haarlemmerstraat-C&A complex dig exposed a 19th-century well of a comparable size (internal diameter 2m, depth 3 m) to that of the neighbourhood well in Zutphen. 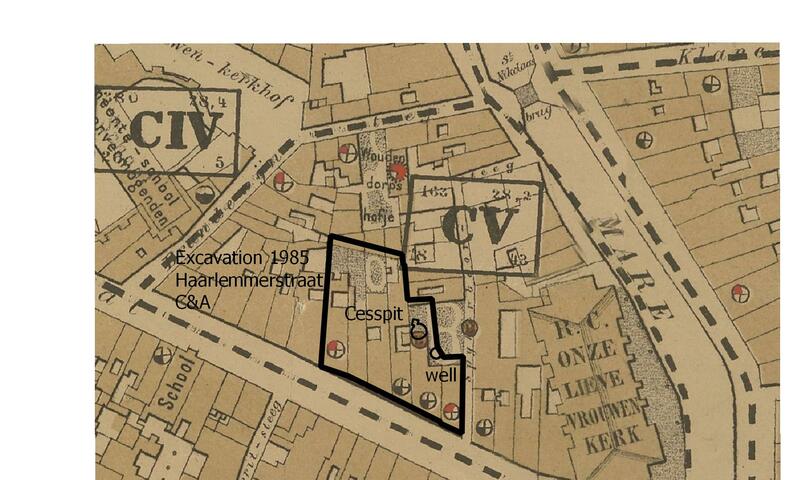 After plotting the archaeological data onto a 19th-century cadastral map, it became clear that this well was situated at the back of a plot on the Haarlemmerstraat, adjacent to the Spijkerboorsteeg alley. The idea that this site served communal use by neighbours is supported by the fact that in this courtyard also the largest known cesspit of Leiden was uncovered. This cesspit, with an internal diameter of 3 metres and a depth of over 3 metres, was built as early as the 15th century, but it will still have been in use in the 19th century, as, marked with a B, it appears on the ‘cholera map of 1870’ (which records the number of townsfolk affected by cholera and typhoid, 1853-1869). Fig. 3: The excavated mega-cesspit and well in the excavation Haarlemmerstraat - C&A complex, 1985. In the cholera map, virtually the same spot shows a circle and a letter B (for beerput - cesspit). This back yard was in use as a courtyard and these were communal facilities. The background plan is a detail of the 1870 cholera map. Considering the parameters of location and diameter, a remarkable picture emerges from the dataset regarding the four excavated medieval wells. It appears that three of them were situated indoors (Steenschuur excavation), which implies that they were intended for private use. The fourth medieval well has such a small diameter (40 cm) that shared use can be ruled out. May we then conclude that collective water-supply facilities were altogether absent in medieval Leiden? No, we should not give up all hope of finding them. The files of 'old archaeological research' contain more data than those of our four major excavations. They include - and this is most interesting in the context of seeking community wells - the archaeological observations made during the renovation of the city's main sewers in the 1980s. It is especially when old street surfaces are broken open, that public wells may come to light. So far, our search for collective water-supply facilities has made it quite clear that water-supply points in courtyards in the medieval town centre of Leiden are typical of the Early Modern era, and not of the Middle Ages. In towns in the eastern Netherlands this may have been very different. Logically, this trend towards 'many water-supply points and few cesspits' is even stronger in the districts of Leiden dating from its 17th-century expansion. In the early years of archaeological research in Leiden it is these parts that were barely investigated. The exciting thing is that especially in these districts infrastructural works have been taking place, prompting large-scale archaeological investigation. The archaeological reports are due to be published in the coming months: what anticipation! In a later blog we shall direct our spotlight onto these new excavations. Deandra de Looff (Universiteit Leiden) for georeferencing the excavation plans; Michel Groothedde (municipality of Zutphen) for information on the Zutphen well; Anne-Hiske Grimme, Chrystel Brandenburgh and Pieter-Jan de Vos (Erfgoed Leiden en Omstreken) for suggestions and access to the excavation documentation, and Xandra Bardet (Groningen).